Promotion reasons can be added to a price matrix record. 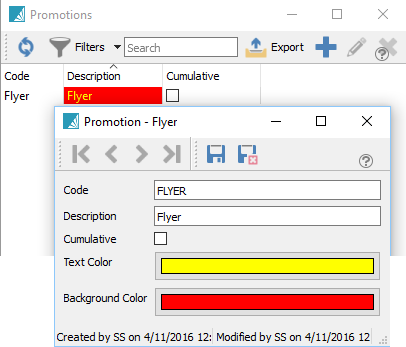 When used, the promotion code will have a name and (optionally) a colour on the sales order line. Cumulative – When checked, and quantity break pricing is used, all items that have the same promotion code will participate toward the quantity calculation of the quantity break. This allows different items, each of which might not achieve a quantity price, to be grouped together so a quantity price is offered. *Example: We have a promotion code established called “WEIGHT”. The promotion is set to “accumulate”. Inventory items DMBELL-25 and DMBELL-30 are associated with this promotion and each item has a quantity break of 6 units, and a price of $19.99 if the quantity purchased meets or exceeds “6”. The items normally sell for $24.99. The use of cumulative promotions allows these items to qualify together for the quantity break price. A sale processed for 3 DMBELL-25 and 3 DMBELL-30 will result in a unit price of $19.99. Text Colour – The colour of the text for this promo code. Background Colour – The colour of the background for this promo code. This video shows how to use Spire’s cumulative pricing to do quantity breaks across multiple items.